After you complete your initial connection from QuickBooks Desktop to Timesheet Mobile, you will want to periodically launch the QuickBooks Web Connector and sync. new Employees and Customers to TSM. The QB Webconnector is included in your QuickBooks installation and can be found in QuickBooks->File->Update Web Services (See below). 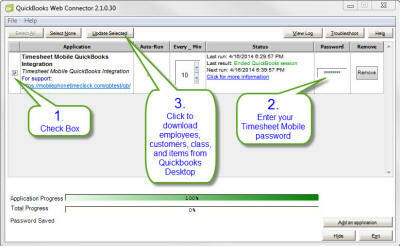 QuickBooks Version 2.2.0.71 minimum is recommended. Once launched, the Web Connector looks like this. You can sync. anytime by clicking the checkbox to the left and then clicking "Update Selected".